The Federal Point Historic Preservation Society held its monthly meeting on Monday, July 19 at 7:30 pm at the Federal Point History Center, 1121-A North Lake Park Blvd., adjacent to Carolina Beach Town Hall. Our speakers this month were Ben Steelman and Amy Hotz of the Wilmington StarNews, talking about their new book, Wilm on Film. In directory format, the book covers just about every feature film, made-for-TV movie, and TV series filmed in Wilmington and surrounding counties. The book is a celebrity watchers’ dream. Longer articles focus on some of the bigger projects such as Fire Starter, Blue Velvet and, of course, Dawson’s Creek and One Tree Hill. Each entry includes a plot synopsis, a list of the major actors and filmmakers involved, a guide to area locations used in filming/taping and a miscellany of fun facts. Ben Steelman is a North Carolina native who graduated from the University of North Carolina at Chapel Hill and shortly afterward (December 1977) came to work at the StarNews, where he’s worked ever since. His articles and reviews have appeared in the Philadelphia Inquirer, N.C. Literary Review, N.C. Historical Review and the Indianapolis Star. He lives in Wilmington with his wife, Beth, and four cats. Amy Holz is a Wilmington native, who graduated from New Hanover High School in 1994. She graduated from UNCW in 1998 with a degree in English and a concentration in professional and creative writing. Her interest in Wilmington’s film industry began when her sister, Caroline, who is 13 years older, acquired a job through a local friend as a production accountant. From middle school on, her connection to the local film industry brought her a variety of jobs, including working at a picture car company called “Central Services” which shipped vintage cars all over the country. Amy began working at the StarNews as a reporter in 2000. A few years later her friend, Allison Ballard, who was the film reporter, quit to go back to school. Because of Amy’s background, she volunteered to take up Allison’s beat and has worked as the local film industry reporter for about four years. This program is a bit different from our usual fare but anyone interested in the film industry in our area will enjoy Ben and Amy’s talk. 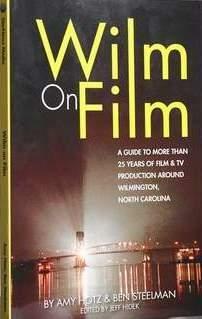 Wilm on Film will be available for purchase and signing after their talk.